Social customer experience is not built purely on old foundations such as ticketing systems. Nor is it designed only to support customers on Facebook, Twitter, and other social media platforms. Today, social customer experience is a hybrid of the two. What started off with a simple model of customer support (“Email us and we’ll help.”) has since evolved to include ticketing systems, live chat, and social media. 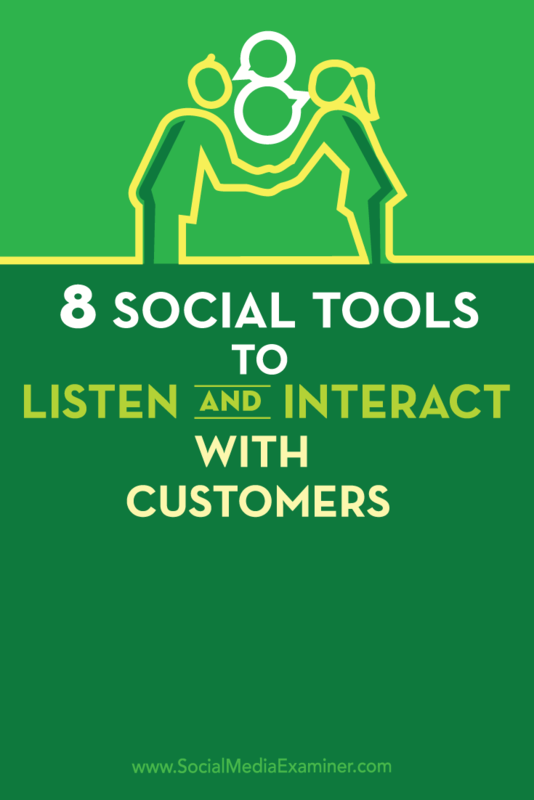 Discover eight tools to help your business listen and interact with customers. For a while, there were no tools available to support the customer experience, so companies responded directly to customers on each social network. However, that made tracking a challenge. Fortunately, a number of social listening tools have cropped up to meet this need. While social is still where customers feel they’re being heard most (especially when reaching out to companies that haven’t humanized their culture outside of a social media platform), not everyone wants to seek support publicly on Twitter or Facebook. This fact gave rise to a newer social customer experience phenomenon: in-app messaging for websites and blogs. Read on to explore both types of tools and find out which ones can help you deliver a solidly social customer experience. So what are the social tools catering to this great evolution in the customer experience? Here’s a hint: They’re not necessarily the tools you’d think to use, especially if you come from a marketer’s school of thought. The idea behind these tools is engagement, follow-up, and (truth be told) reactivity. Let’s take a look at some of the social listening tools that might work for your business. Sparkcentral is a customer service tool that lets you communicate with your customers across Twitter, Facebook, and Instagram in real time, supporting needs as they arise. The company calls itself a channel-agnostic customer engagement platform because it can focus on social media while also supporting in-app messaging for team members. SparkCentral recently announced support for Facebook Messenger. 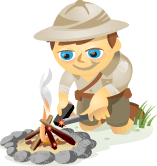 Although Sparkcentral is similar to many of the other tools in this article, it’s geared toward the enterprise and priced accordingly. While Sprout Social is touted as a tool for social media marketing, it also has a deeply involved component for social customer service. 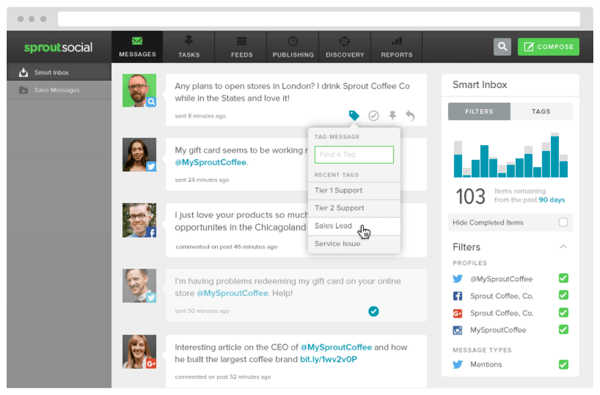 You can see Tweets and Facebook posts on a dashboard where team members can respond to them. 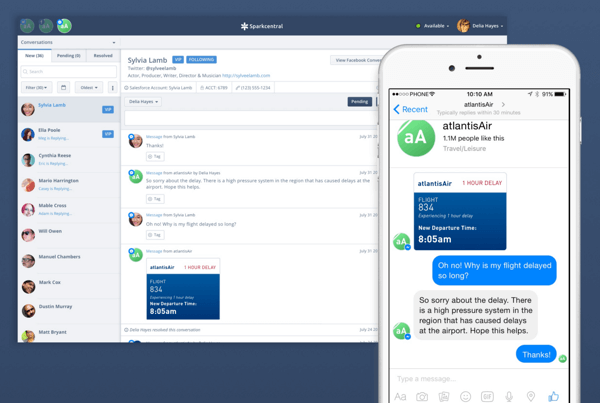 Sprout Social has a robust ticket system to let your team manage customer relations efficiently and effectively. It will also allow service teams to access data such as customer history and their involvement. Think of these support issues like “tickets,” which can be hidden away once they’re acted on. Real-time tracking and a beautiful interface for reporting ensures that everyone is accountable and on the same page. Respond by Buffer is possibly the simplest user tool exclusively for social customer service, and focuses only on Twitter. You can respond to customers, review previous chat history, and follow/block users. It has an easy-to-use interface for teams and lots of accountability. If you’ve used Hootsuite (typically the first step in the social media customer service game, discussed below), Respond is the next step up to give you an edge on your social customer service. It can support both small and large teams looking for simplicity and no other frills. Pricing is also more accessible to smaller businesses. Like many of the other tools on this list, Lithium is intended for managing customer service at scale. It will allow your representatives to respond directly to customers, engage, and route issues to appropriate team members. It also has (like some of the other enterprise tools) the capability to build templated content so it’s easy to access macros for frequently asked questions. You can also view reviews of support reps across the board. Hootsuite makes it easy for low-touch businesses to follow conversations for customer service. It’s a great tool for one-person response teams, but once you have a larger team, you’ll want to look into different opportunities since it’s difficult to manage customer service exclusively on the platform. It doesn’t let you archive communications and it’s harder to streamline the flow. That said, Hootsuite is building out some customer service technologies in 2016 that are expected to work seamlessly with other ticketing systems, and it will be interesting to see how that evolves. Sprinklr is an enterprise solution that lets you build relationships with customers via monitoring, listening, and customer service. You can engage across social channels, communities, web portals, mobile applications, and even retail kiosks. Team members can collaborate and receive a unified view of the customer, and marketing and sales teams can work in tandem with the customer service teams. In-app messengers are a bit different than the aforementioned products that monitor the real-time social media space. Instead, these are tools that let the conversation happen on your site, rather than on social media platforms. Like the tools above, team members can talk to customers and respond to their needs. Everyone can see the conversation from the dashboard. Nudgespot also offers segmentation, A/B testing, and triggered messages based on a specific behavior or page visit for marketing. However, the tool speaks directly to the customer experience in that it will allow customers to talk to a company representative without any heavy lifting or a third-party social media account. 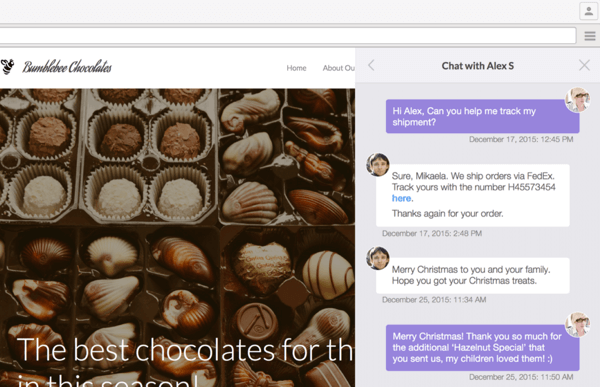 Nudgespot lets you and your team chat with customers without them having to leave your site. Nudgespot is a freemium product with a more fully featured product that’s only a few hundred dollars a month. That beats most of the products here with enterprise pricing in the four to five digits. Similar to Nudgespot, Intercom lets you provide built-in messaging through a little icon that lives in the bottom-right corner of your site. It offers similar features to Nudgespot and has pretty cool data. You can segment based on a number of data points: name, email, when someone signed up, when they were last seen, the number of sessions they’ve had on your website, the country they’re from, the last time you contacted them, their browser, their operating system, and more. The filters shown below illustrate the possibilities. Customers can start conversations with you by clicking on the icon in the corner of your site. 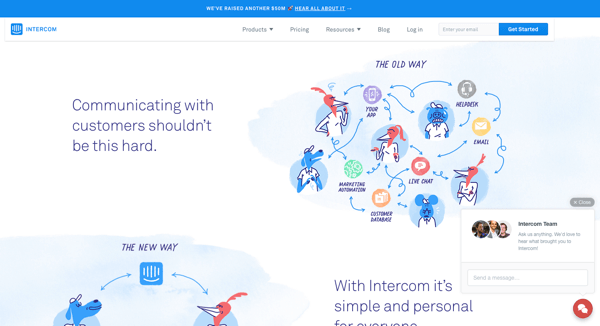 Intercom is more enterprise in terms of its pricing model. It serves more of an SaaS environment with a limited number of users. Your fee is based on the number of users in your database, so the more users you add, the more expensive the plan will be. If your product has thousands of users, Intercom may ultimately cost you a pretty penny. You’ll need to carefully evaluate these tools and choose the ones that best serve your business’s needs. Perhaps you’ll need one tool that caters to social media and one that’s tailored to your website. Or maybe you’ll simply need to talk to the social media audience. There are many options to choose from to better meet the wants, needs, and desires of your customers. What do you think? Have you tried some of the tools on this list? 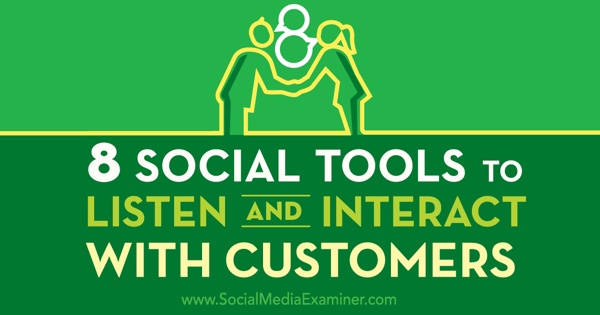 What tools work best for social customer service for your business? Please share your thoughts in the comments below. Tips on eight tools your business can use to listen and interact with customers. Tamar Weinberg is a professional hustler and author of the bestselling book The New Community Rules: Marketing on the Social Web.